Wednesday the attendees began their classes. It was interesting to hear about what they learned throughout the day. Wednesday was also the start of the trade show. We were very excited to unveil our new mobile app! Residents can download the mobile app to request “411” assistance, view upcoming events, and be alerted of new agendas and meeting minutes. The clerks loved coming to our booth to grab a great deal of goodies that we were handing out. The most popular items were definitely the popcorn and jelly beans. Finally, on Thursday we met with even more attendees and gave out even more goodies during the trade show. The clerks loved visiting our booth right before their classes to grab a bag of popcorn. That afternoon, we had the privilege to attend the Clerk of the Year Dinner. 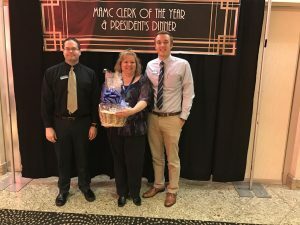 The MAMC gave out awards to the best clerk for a Michigan city, township, and village. Also, congratulations to Barbara from the City of Ithaca on winning our prize basket! 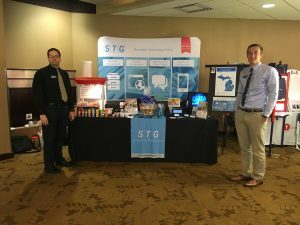 Shumaker Group had a great time at the annual MAMC conference this year! We cannot wait to attend next year in Traverse City!